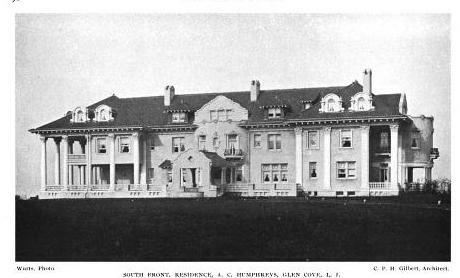 The Alexander Crombie Humphreys estate designed by C.P.H. 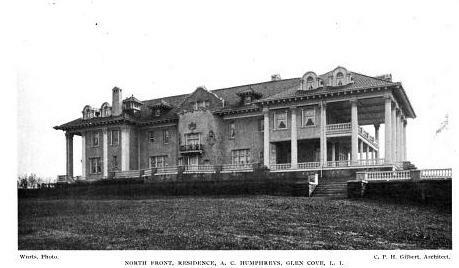 Gilbert between 1899-1902 in Glen Cove. Humphreys was an engineer who founded the gas utilities firm of Humphreys & Glasgow and was also second president of the Stevens Institute of Technology in NJ. 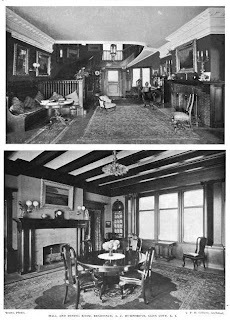 This home was eventually purchased by Frank W. Woolworth but would burn and be replaced with the current incarnation of 'Winfield Hall'. Click HERE for more on the Humphreys residence. Slightly Off Topic: So it doesn't get lost in earlier posts, NEWSDAY has an article today about scheduled nature walks on most Saturdays at Hoffman Center. They begin in front of the mansion. Well, i will say this about the second Winfield Hall- it was an improvement over the first. This one has a better plan. Other than that. I try, really I do, but Gilbert's buildings have a harsh, graceless, ungainly quality. Definitely like the variety in the floor plan of Winfield I and the stables are fantastic. 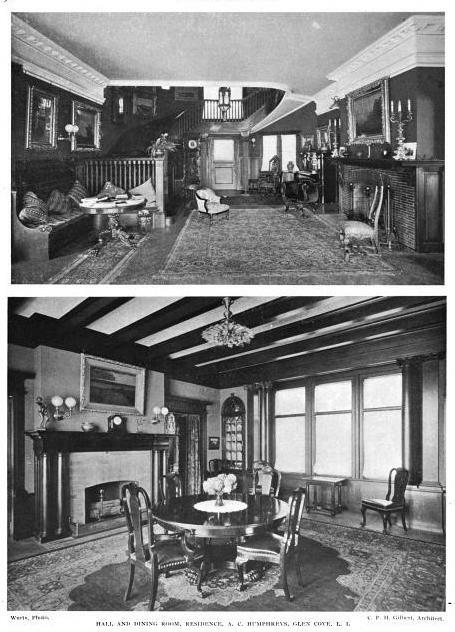 Even though Winfield II has a similar arrangement of rooms the result was much more ostentatious when rebuilt after the fire and I happen to prefer Winfield II's interiors by far. 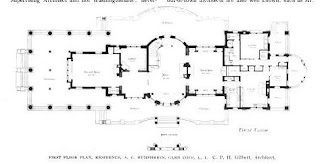 That being said, I think CPH hit his stride with the ornate and eclectic townhouses of Delamar, Woolworth (demolished), Fletcher, Kleeberg, Converse, etc. etc. just a partial list of some of the best examples of townhouses that are still extant in NYC, despite what a few naysayers may say. Also CPH offerings 2 days in a row? Is that legally allowed without risking severe upset stomachs in certain commentators? & we all agreed 'Hilaire' (posted 4.27.12) would have made a great Halloween house -- this house is just scary; that balcony inside an overblown portico looks like the perfect place for a witches' coven ... not that I would know. 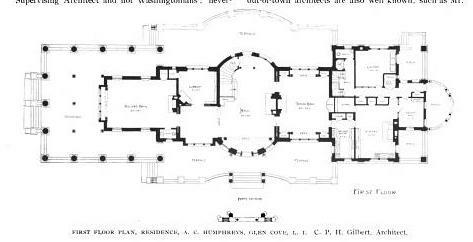 The main difference in floor plans I noted between this house & the eventual 'Winfield Hall' is that Alexander C. Humphreys didn't need connecting bathrooms with his "nurse" so she could tend to him undetected by the household. What do you call someone who tears down one Gilbert house only to put up another in its place? I also need your insight in the "lay of the land". If you navigate back to the partition sale of Winfield there is a view looking west to Red Springs Woods. The online copy is grainy but you can make out a structure across Valley to the left with a "Dutch" roof-line that looks like "Hilaire". I have a hard copy and can see even more detail. Could this be correct? Are you aware of any house at the top of Red Springs? It always seemed odd to name a property "Hilaire" when you built in gully. Is there a view from the elevation? You have the hill of Red Spring to the west and WH to the east. Can you see the sound between the two? Call me naysayer if you must, but one cannot, simply CANNOT with a straight face put the Fletcher house in the same class with the Frick mansion, the Duke mansion, the Kahn mansion, the Burden mansion, the Whitney mansion, the or even some eccentric ones like the Goadby Loew house---well you see where this is going. You simply can't, because it isn't. It may be handsome, it may be grand, it may be elaborate, but those are not alone the criteria by which architecture is judged or succeeds, and it isn't first string architecture by any objective critical standards. And if one compares it with some of the lost houses, it lags even further behind. Likewise Delamar. I care not for the interiors of the first Winfield, but the plan is far superior in terms of circulation and spatial effect. While not exactly Long Island related, there is no need to make comparisons with the other wonderful NYC town homes mentioned above, since there is room for all the best and these stand among the very best in NYC. Good catch. The map incorrectly labels the site of the former garage complex of Old Orchard as the Groendak's stables and garage. Groendak's stables and garage still exist and are labled on the map as "Servant's quarters, Henry C. Martin". You are correct- that view to the west in the partition sale of Winfield Hall shows the roofline of Hilaire. The topography is somewhat deceptive in this area: Hilaire actually was built on a hill (or as much of a hill as we get in our relatively flat area of the world), with the property sloping sharply down to the north and west of the house. North Country Colony was fairly cleverly laid out, and Hilaire would have enjoyed pretty good distant views of the Sound before surrounding trees grew to their current size, as there were no structures between Hilaire and the beach. Its name may not have been as farfetched as originally suspected. I also believe that the photos that have been posted of the original Hilaire show the south front of the house, the north front (facing Valley Road) enjoying the hill, air and view. Thanks for the reply. I wonder then if the incorrect wikimapia tag is still part of the Parker estate. Property card has it as a stable converted into residence. Could it have been a secondary structure? Or part of another estate? The Parker Handy garage complex is still part of the what is identified as the Henry Martin property. It is configured as two separate, but connected cottages with garages in between. The current owner of the Henry Martin house has, in the past two years, substantially enlarged the eastern most cottage as a house for his daughter and her family. 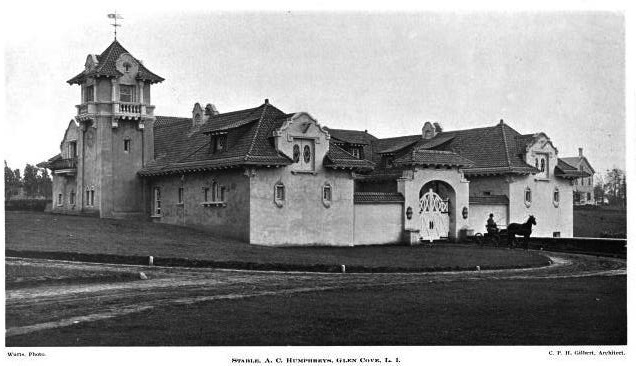 The structure incorrectly listed on Wickemapia as the Groendak stables and garage was originally a three or four car garage for Old Orchard, with a laundry room attached and quarters for a chauffer above. It was cleaved off from Old Orchard following the original owner's death in 1941 and converted to a charming smallish cottage. It's property includes the huge vegetable and cutting garden of Old Orchard, and the ghost of the original beds are still visible when the sun sets as shadows in an otherwise pristine lawn. HPHS- When I first knew of 46 Red Spring Lane, it was owned by Arthur Loew (Pembroke)and his superintendant lived there. It is roughly directly across Red Spring Lane from the main (original) gates to Pembroke, so I always assumed it was an original part of the Pembroke Estate, if you will. It is also close enought to the Whitney and Maxwell houses that it could as easily have been connected to those properties as well and have been a later purchase by Loew.